Regular visitors to this site might remember my review of the complete pork chop dinner in a crock pot. My vegetables were over cooked, the pork chops were dry, but the sweet potatoes were delicious. In my summary, I said I would experiment with potatoes in the crock pot and that next time, I would try using a pork roast instead of chops. I still hadn’t tried that experiment, but I knew that I was going to have a very busy day today. 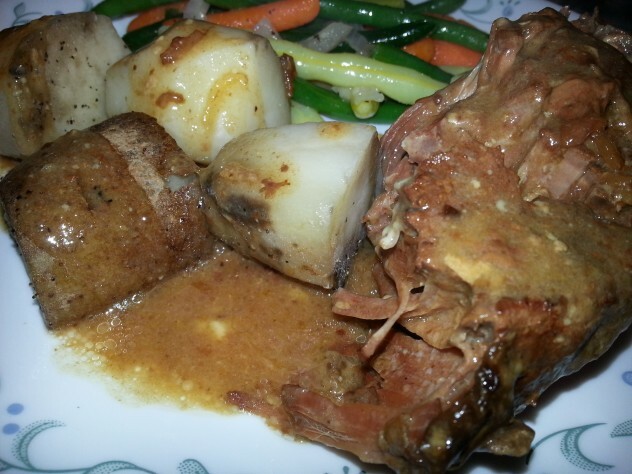 I decided to make my favorite three ingredient pot roast in the crock pot and try to use what I learned from the pork chop dinner in a crock pot experiment to make a complete meal in my slow cooker. I put a seared a chuck roast and put it into the crock pot with all of the other ingredients as I described in my previous post. I folded two pieces of foil into strips and arranged them on top of the pot roast ingredients so that it would be easier to remove the foil pouch without puncturing it. I peeled and cut potatoes into large chunks and placed them, along with salt, pepper, and butter, into a foil pouch that I placed on top of the roast. I know that potatoes can be cooked in the crockpot without the foil pouch, but Bus Boy doesn’t like the potatoes to be covered in gravy. If I want him to eat, his potatoes have to be separate. 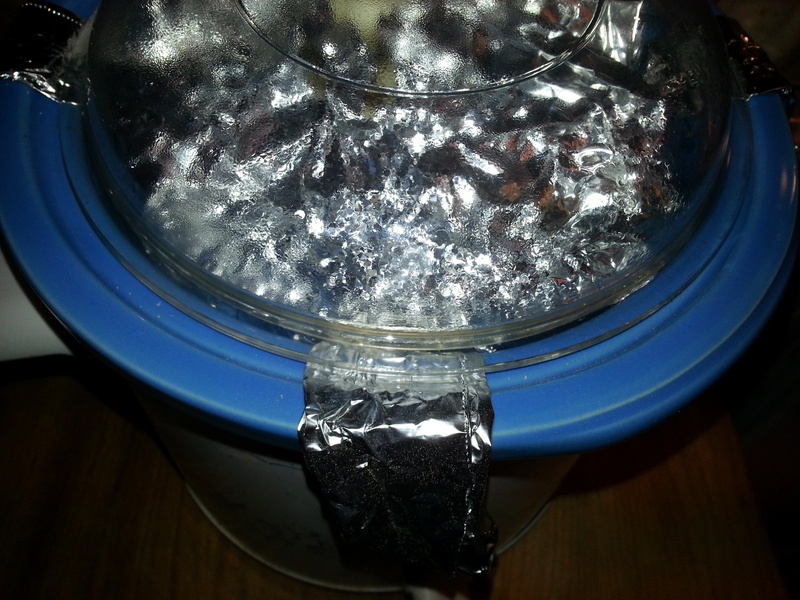 This pouch was sealed tightly to help steam the potatoes. Since Baker’s man arrives home before I do, I had originally intended that he would top this with a foil pouch full of seasoned vegetables that would cook on top for the last hour or so, but my crock pot was too full with just the potatoes and the roast. I put the lid on my slow cooker and turned it on low. 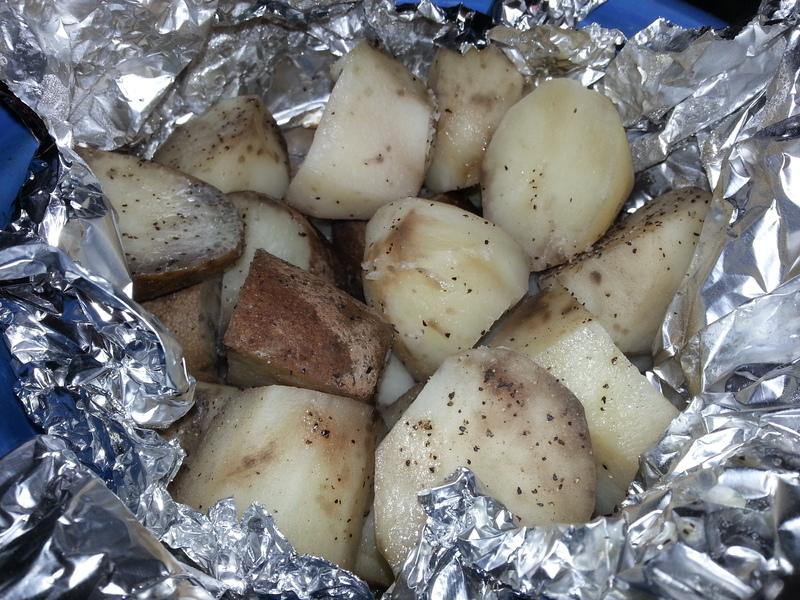 After about 10 hours, I used the foil strips to remove the pouch of potatoes to discover that they were perfectly cooked though they had some dark spots on them from the cooking process. This was most likely caused because the potatoes were cooked in too alkaline of an environment. Next time, I will use small, unpeeled potatoes for this dish, or I may use something to make the potato pouch more acidic. 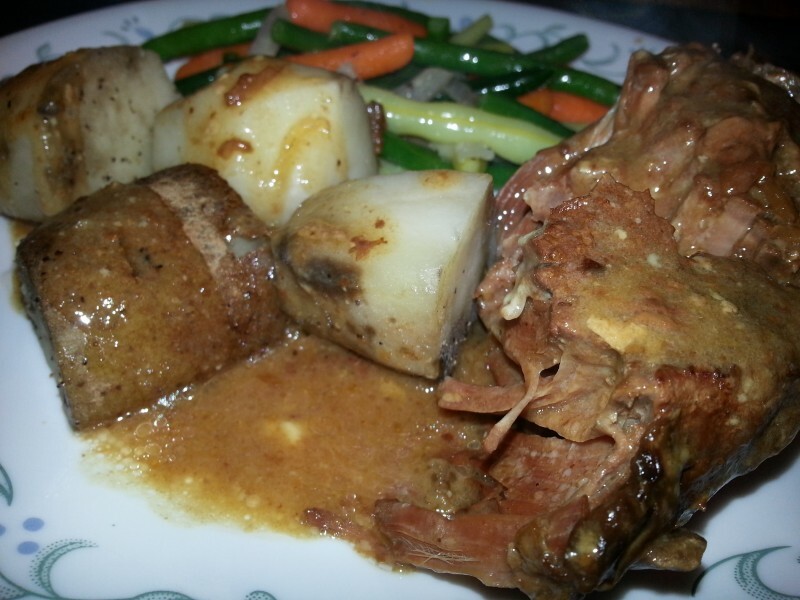 The roast was perfectly moist and tender and full of flavor. All I had to do was to quickly steam a vegetable medley on the stove and serve our complete pot roast dinner. The final product was delicious, and I plan to continue experimenting with the idea of a complete meal being prepared in a crock pot. Because on e member of my household doesn't like to eat potatoes that have been cooked in pot roast gravy, I made a pouch to cook the potatoes on top of the roast. This worked out well. If I had a larger crock pot, I could have added a pouch of vegetables about an hour before serving time, and this would have produced a complete meal. Using two large pieces of foil, create a foil cross on top of the roast and canned soup mixture, making sure that the ends overhang the sides of the crock pot. 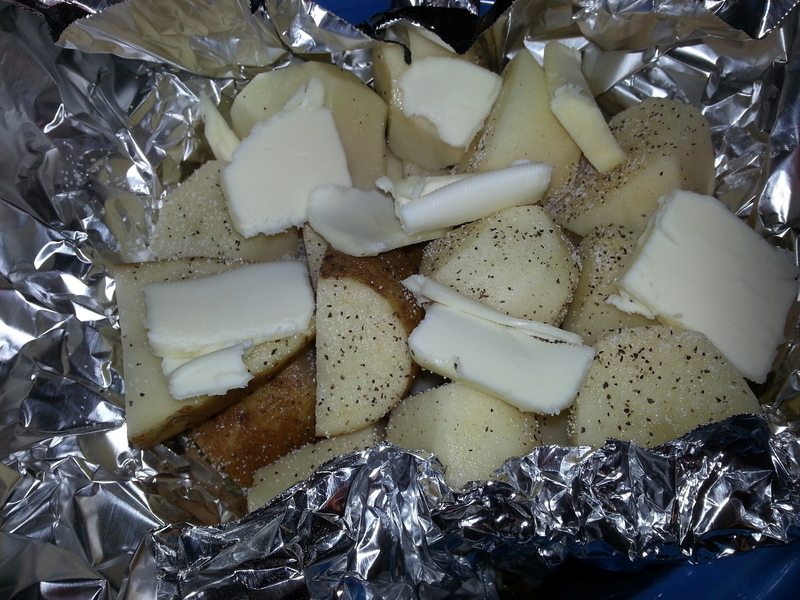 Place peeled and cut potatoes onto a large piece of heavy duty foil. Season, to taste, with salt and pepper and top with pieces of butter. 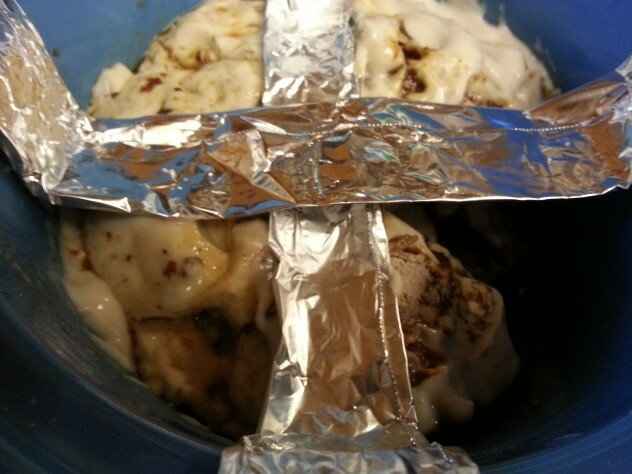 Seal the pouch containing the potatoes and place it in the crock pot on top of the foil cross. Carefully remove the pouch containing the potatoes by lifting on the foil strips, and place the pouch onto a plate. Open the pouch carefully. The contents are hot and steam will escape when you open it. 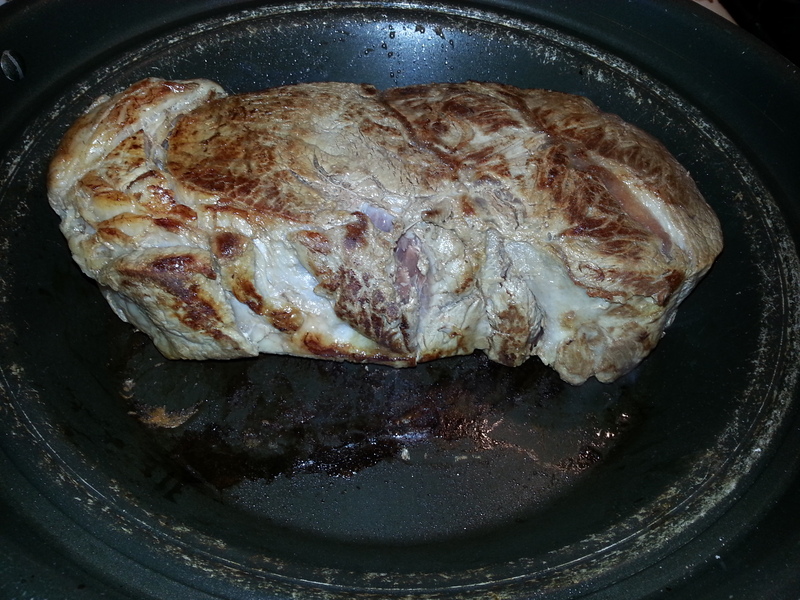 The pot roast and gravy mixture that's in the pot will look very ugly and disgusting at this point. That's OK.
Give the gravy left in the pot a stir to mix well. This will improve it's appearance. Optional: If you want to thicken the gravy, turn pot to high, mix 2 tablespoons of flour with two tablespoons of water. Turn the crock pot setting to high, and add this mixture, stirring well. Allow to simmer for about 5 minutes or until gravy begins to thicken. What Can You Do With Leftover Cholent? All of it looks yummy. It reminds me of Sunday dinners when my Mom used an electric skillet on very low. She used it like a crock pot but added water or broth every 30 minutes or so to avoid any scorching. She didn’t get a crock pot until the 90s. Can you believe it? She also preferred a dutch oven pot that was made from cast aluminum. An oldie from the 40s. any way you roast it, slow is the best. I agree that slow is the best. I got a slow cooker in college. It was the kind that the crock was permanently inside of it. I remember that we were so broke that it took me forever to save up the money for that bottom of the line crock pot. It was a life saver for a couple of poor, starving college students. I still have it and use it on occasion though most of the time, I use one with a removable crock. As for your mother’s cast aluminum dutch oven. I think I have one of those in a cabinet in the garage. My mom gave me an entire set of cast aluminum cookware when I moved out. I used them all the way through college, too. Hi Patti. This looks so yummy! I definitely will try this soon. We have a slow cooker, but haven’t used it much so I think this would be a great recipe to try! I like that I can prepare dinner without having to pay attention to the food once it’s started. Let me know how you like it.